I decided to give this whole article writing thing another shot. I have a very love/hate relationship with content creation, so I don't do it very often, but I figured I may as well have a place to write when I want to. I decided to come out of my creative shell and write again about one of my favorite decks to play recently. The original decklist came from Alex Ullman, one of the premier authors on Pauper. You can find his article here. Funnily enough, it was just a decklist that was at the end of a general article on Pauper and the impact the New World Order has had on it. I was experimenting with the different versions of the Temur Emerge deck that broke out of the Pro Tour at the time that I noticed a Pauper Emerge decklist in Alex's article. After trying it out, I instantly fell in love. I am a sucker for value and this deck simply oozes value. Cost reduction mechanics have typically been very good and/or downright oppressive in the history of Magic. The immediate one that comes to mind is Affinity. Affinity can be seen in virtually every constucted format since it's introduction in Mirrodin. I doubt we will ever get anything quite on the power level as Affinity ever again, but cost reductions are cost reductions. In the context of Emerge, Creatures become rituals on sticks with added effects stapled on such as drawing a card or fetching a land. That can obviously be very powerful as standard decks have already shown as the pros at the Pro Tour actually had to debate killing Pilgrim's Eyes of all things. The Empath package and other Emerge fodder. This deck features what I like to call the "Empath package" featuring Fierce Empath and Llanowar Empath. Fierce Empath is the single best creature to pair with Emerge. It boils down to being a tutor and a ritual in the same card! Llanowar Empath is a suitable source of card advantage. A notable interaction with the scry is that it goes against conventional wisdom in that you can leave a creature you would normally put on the bottom to ensure that you get card advantage out of it. Spinning the dice is always on the table with decent odds given the 31 creatures in the deck if you have others ways to gain card advantage. The rest of the Emerge fodder are cards like Elvish Visionary and Sylvan Ranger that gain an card or a land respectively. The mana elves can also be used as Emerge fuel if absolutely required. While playing the deck, the typical game plan is to get a Fierce Empath or another fodder creature and use it to chain into the Emerge threats. There will be times where it will be necessary to chain a number of Emerge creatures. Generally, the plan will be to get It of the Horrid Swarm down first then chain it into a Wretched Gryff. I think a 3/4 flyer is much better than a 4/4 ground creature. It feels similar to a Birthing Pod chain except you can do all the steps in a single turn for a massive swing in board position and card advantage. Other times, the game plan will just be to go for the grind and don't waste Emerge threats into other Emerge threats. The deck plays like a fast midrange ramp deck. I've found the deck to be well positioned against other fair creature decks. It goes wide just as well against token based decks and the top end threats can match up pretty well against any 3 or 4 drop respectively. The deck is very strong in board stalls because of Wretched Gryff. I've found that most opponents don't have removal for a 3/4 colorless flier that chips away at the opponent's life total. The deck can struggle against Mono Black if the opponent can get Cuombajj Witches going early as a lot of the deck is full of 1/1s. The deck can also be weak to Gray Merchant as the removal suite is light. 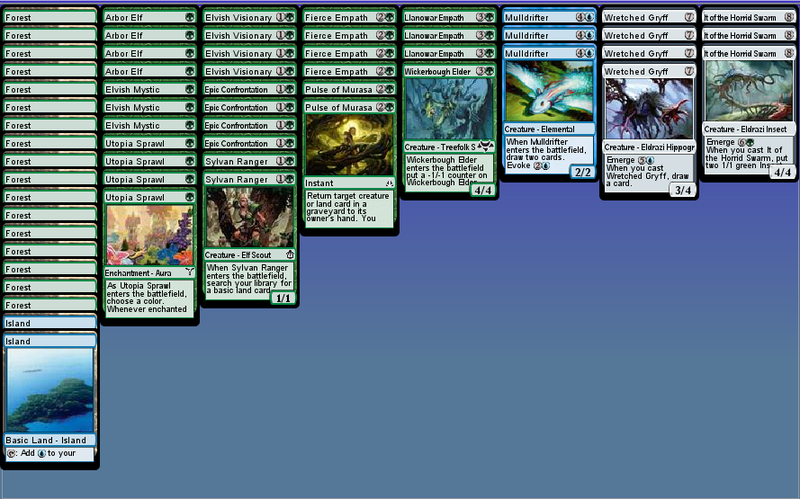 The deck is fairly resilient to edict effects however. A sizable portion of the sideboard is devoted to the Drake matchup. I haven't had a ton of experience testing this matchup, but it feels pretty bad to me on paper. No instant speed removal or disruption in the maindeck. The goal is to race as fast as possible game 1. After board, options open up with more removal, counterspells, and also graveyard hate. I think the deck will get much better after the inevitable Drake banning. I think the deck is a reasonable choice in most metagames and it's a blast to play. I'm surprised that no dedicated Emerge strategy has appeared on the MTGO metagame from what I can gather from my resources. It's possible there's a radically different build that can be successful such as Turbo Emerge including Frogmites and/or Skyshroud Cutters to power out an extremely fast threat or one that has more blue in it with Coiling Oracles, etc. It's still a fairly new archetype that can go in a few different ways, but it feels like it can be a player in the Pauper metagame. It's also fairly cheap comparatively clocking it at $34 dollars on TCGPlayer and less than $30 tickets on MTGO. On Monday, September 26th of 2016, WOTC announced the Ban and Restricted list changes. To my surprise, no changes were announced. I have some pretty strong opinions for Pauper and Drake is a problem in my mind. First of all, the lead developer of Eternal Masters, Adam Prosak, is on the record saying that he would've been "much less likely" to include Peregrine Drake in Eternal Masters if he knew that Cloud of Faeries was going to be banned. He also says that he believes that "Peregrine Drake is weaker than Cloud of Faeries" which is a statement that I actually disagree in the context of the combo with Ghostly Flicker. With Cloud of Faeries you needed either two bouncelands, 2 Familiars, or 1 and 1 in combination to get mana with Ghostly Flicker. With Peregrine Drake, you only need 4 or 5 lands in play and no Familiars or other cost reductions needed. This allows the deck to exist in only 2 colors instead of 3 and red is viable with Peregrine Drake when it wasn't with Cloud of Faeries. The familiars pushed the deck into Esper and much less relevant interaction or removal was available in the deck. Secondly, Drake has fostered much less format diversity by pushing out former beloved staples such as Mono Black Control and Kuldotha Jeskai from the format virtually entirely. From MTGGoldfish, Mono Black Control has dropped all the way down to 0.5% metagame share and Kuldotha Jeskai isn't even listed in the meta game. For as long as I have been around or playing Pauper, Mono Black and Kuldotha Jeskai were always staples of the format. That's not to say that they don't deserve to be in the metagame, it's just deeply concerning that they are suddenly pushed out entirely. I thought they were great arbitrators of the format, for lack of a better word. They weren't oppressive, but they were a good gauge to test decks against. Now with Drake, you have to absolutely have a plan to beat it or your deck can't realistically can't compete. Of course, it can be argued that concept will always exist, but Drake takes that to a whole different level at roughly 25% of the metagame. That means on average, every four games, Drake will be one of the decks. Thirdly, Drake stomps out all new innovation of newly released sets. Emerge strategies can't possibly compete with Drake unless you devote an unreasonable amount of sideboard space for it. I doubt if we see anything from Kaladesh spur a new archetype or bring back one that fallen out of favor. The only smash hit thing in my mind is Gearseeker Serpent in Affinity because it beats a Gurmag Angler in combat, but Angler has fallen all the way down to 21st place on the most played creatures list at only 11% of the metagame. Energy doesn't seem to have any relevant payoffs and vehicles, with the possible exception of Sky Skiff, just doesn't hit any spots for me. There obviously are ways to defend against Peregrine Drake, it dies to Lightning Bolt of all things, but it has been very clear that it is oppressive and has pushed out at least two decks from the metagame virtually entirely. That is a huge problem in my opinion.